Well, the Fall is almost here and that can only mean one thing... Oktoberfest! 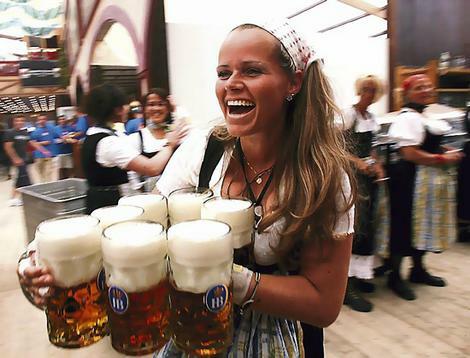 Oktoberfest is an amazing German holiday held in Munich, Germany that typically lasts 17 or 18 days. This impressive festival started in 1810 and has grown substantially ever since. The attendance for 2010 was a reported 6.4 MILLION visitors!!! That's an impressive amount of drunk people in one place. Talk about a party! Those Oktoberfest Girls have talent! So today, we are looking at Samuel Adams Octoberfest. I previously reviewed the Widmer Brothers Okto Festival Ale, which is their version. 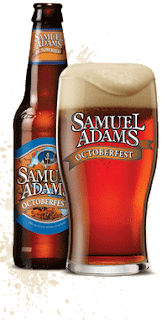 Samuel Adams Octoberfest is made from five different roasted malts and Bavarian Noble hops, like some of their other beers. It pours a light red-copper color and smells of sweet malts, with blunted hops (they're there, but less than in Boston Lager). This beer tastes primarily of lots of sweet malts, some toffee, with a vague hint of nuts and only mild hops. Samuel Adams Octoberfest ends up tasting like a pretty stereotypical Oktoberfest beer, although solidly done. 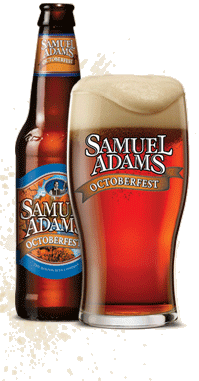 Samuel Adams Octoberfest is nothing remarkable or ground-breaking, but when the cool Fall weather starts to roll in, this will fit the season perfectly. Drink This: if you want a solid, Oktoberfest-style bier (beer). Don't Drink This: if you want something complex and over-the-top. This is a good version of the style and I will likely drink several this Fall, but it is not the best Oktoberfest beer I have ever had.